Sweet, salty bacon, wrapped around seasoned chicken and then baked to a crisp perfection. 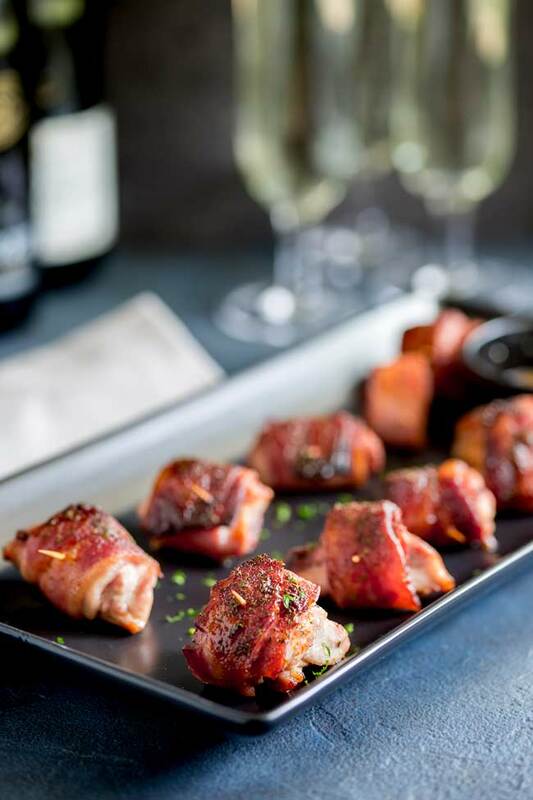 These Brown Sugar Bacon Wrapped Chicken Bites will be demolished! A must for any party or gathering. These really don’t ever last long! There is something about that sweet and salty mix that has people reaching for another. And being wrapped in bacon!!! I mean, who doesn’t love bacon! The chicken is seasoned with salt, pepper, rosemary and onion powder (although you could use poultry seasoning) and I think that is the key to this recipe. The chicken is so delicious and then the salty bacon and brown sugar just finish everything off. OH YUM!!! I think the moment you sprinkle brown sugar on something, kids will eat them. Well certainly mine do! The sweet salty bacon smell, always brings them to the kitchen! And although I serve these as a canapé or appetizer, I have been known to serve them for tea with some potato wedges and a salad. At a party I like to add a small dish of something sweet and spicy to dip them in. 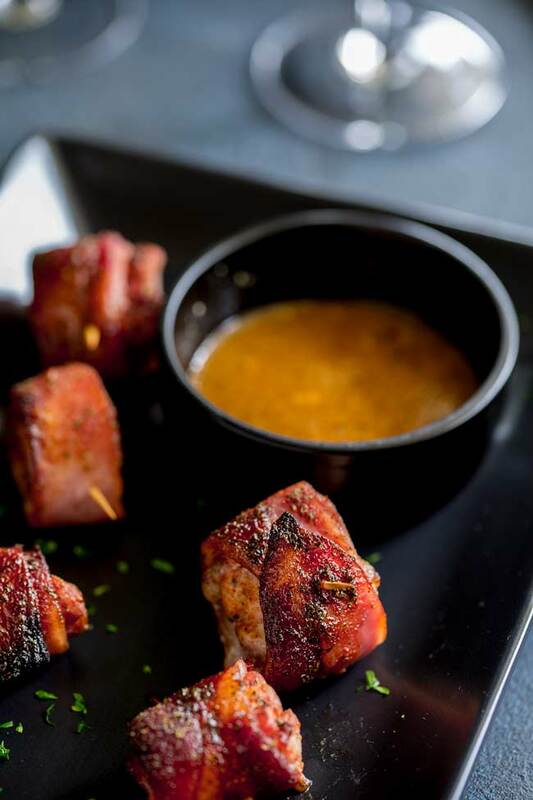 A simple mustard maple sauce, spiked with some chilli powder and paprika works fabulously. 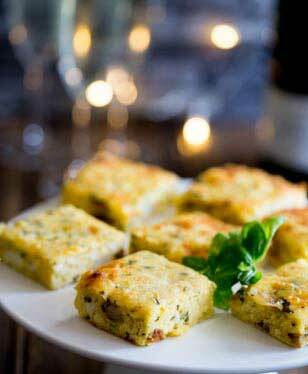 p.s If you are looking for another canapé idea why not try my Sheet Pan Potato Frittata Squares with Basil and Chive, they cook in the oven at the same temperature as these Brown Sugar Bacon Wrapped Chicken Bites and are delicious warm or at room temperature. 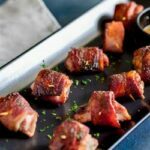 If you love this recipe for Brown Sugar Bacon Wrapped Chicken Bites why not pin them for later. Sweet, salty bacon, wrapped around seasoned chicken and then baked to a crisp perfection. 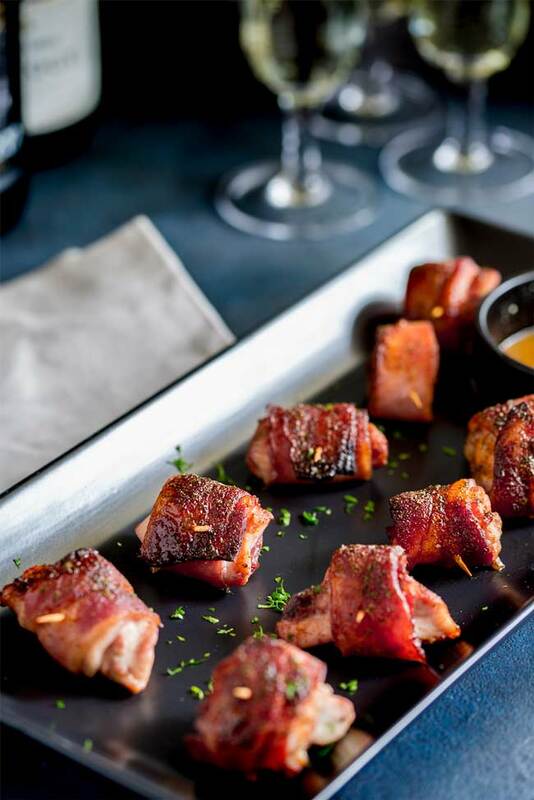 These Brown Sugar Bacon Wrapped Chicken Bites will be demolished! And are a must for any party or gathering. To aid clean up cover your baking tray with a layer of aluminium foil. Place a cookie cooling rack on top of the baking tray, this allows the bacon to crisp on all sides. Cut the chicken into 1 inch cubes (I aim for 16 small bites out of each chicken breast) and sprinkle over the salt, black pepper, rosemary and onion powder. Tip the sugar in a small bowl adding in the salt and smoked paprika. Wrap each piece of chicken with a piece of bacon and secure with a cocktail stick. Roll the chicken bites in the brown sugar mixture and place on the prepared rack. Bake for about 30 minutes until bacon is crisp. 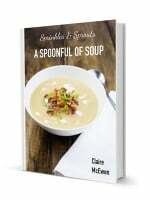 I served mine with a mustard maple dipping sauce, spiked with paprika. 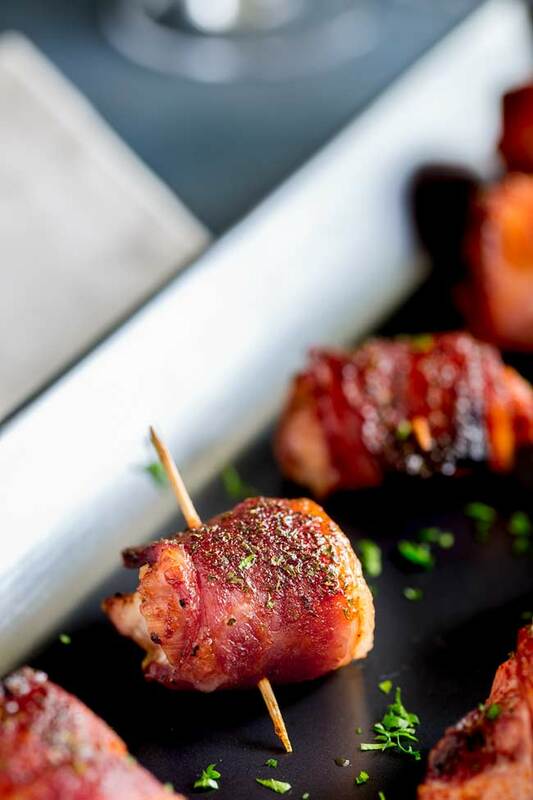 If you love food why not subscribe to my newsletter, I will drop you an email every now and then, just to say hi and send you a couple of recipes think you might love, like these Brown Sugar Bacon Wrapped Chicken Bites. Hi Claire! Bacon makes everything better! You woudn’t want to set a platter of these too close to me, nobody else would get any! I love dips, but usually end up wearing some (or a lot)! Haha, I am exactly the same Dorothy!! !